I’m sitting in a hotel room in Northern California. I hear a train go through the town. It’s 3 am. I’ve just finished doing ten minutes of yoga to untangle my back from sitting on a drum stool all day and sleeping in a bed that is not my own. This is what I do for a living. I am a drummer. I play with Ace Frehley of Kiss. When I was seven years old, I would lie on the floor of my bedroom and draw pictures of Ace’s face. Now I make records with him. Life is good. I’m reflecting back on the day, the time I spent with Ace but more specifically, the time I spent with the click track. That skull-splitting cowbell sound that’s shot between the headphones aimed into my ears. I wear earplugs and then put the headphones on because I need them to be loud enough to get over the acoustic sound of hitting my drums as hard I do. There’s no way around it, the headphones are screaming. 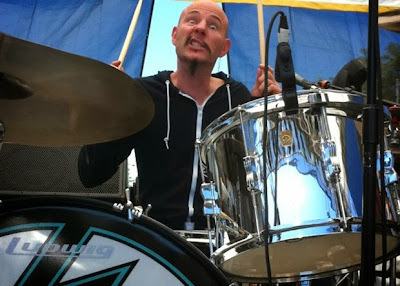 If I can’t hear my drums well enough I lose my finesse, so I take one of the earplugs out a little bit. I will feel that at night, in my ears when I lie in bed and then probably the next morning, along with a slight headache from my skull being rattled. I’ve noticed a parallel between my relationship with the click track and my relationship with life. When I start out, I’m usually a little ahead. Then I compensate and pull back, but that’s usually a bit too much. If I let go of all the thoughts in my mind and just be in the moment, I settle in and something magical happens. It gets bigger, more powerful, and more epic. Sometimes I try too hard and lose my focus. Sometimes I get excited and pull ahead and lose my flow. Sometimes I try to make a flam be the biggest, greatest moment in the world, and I lose my groove. But there is a place between being relaxed, focused, and skilled, where it all comes together. You learn the lesson, and then you get to move on. There’s a guy in Hollywood who hands out bumper stickers that say, “Drum machines have no soul.” This is probably true, but that’s okay. I’m willing to learn from anything—whether from the cosmos or a 9V battery-powered machine. My first show with Ace Frehley was at the Best Buy Theater in Times Square, NY. Two weeks before the show, our bassist casually tells me, “Oh, by the way you need a kit that you can leave with us. We use all our own backline at every show.” I had been using a recently acquired 1976 clear Ludwig Vistalite set (26″, 14″, 16″, and 18″). But I didn’t want that kit going out on the road, being that it’s thirty-six years old and plastic. Ludwig offered to make me a kit, but I needed it in two weeks and that wasn’t enough time. I decided to put a wood kit together and cover it in chrome. I hunted down a set of ’60s 3-ply shells (14×28, 10×14, 16×16, and 16×18). I needed help covering this kit. I called Mark Carter, who used to wrap drums at Creative Music in Wethersfield, CT. The more I have traveled, I realize how lucky I was to have this place in my back yard. Bob Gatzen used to own Creative Music, and he was a developer for Noble and Cooley, Evans, Calato, and Zildjian, so there was always some prototype in the back room that he would encourage me to check out. The guys who worked at the shop were working drummers. They had practical experience and could help me when I was breaking things left and right. They showed me how to tune drums and pick out cymbals. When I kept blasting through my kick drum heads, Mark told me to cut a circle of moleskin and put it on the head. It sounded gross, but it worked. And a few years later, kick pads started appearing on the market. I started telling a few drummer friends that I was coming back, and Mark was going to recover my kit. They all responded the same, “I’m coming over.” We started Sunday around noon, and the last drum was finished at about 10 pm. The coolest part of the experience was having all those guys in my garage working on drums. The kit debuted in Erie, PA, in front of about 20,000 people.